Give St. Patrick an early Irish welcome this year with the Federal Hill Irish Stroll on Saturday, March 16th. This high-voltage bar crawl is for only the most spirited St. Patrick’s Day revelers, because we’re giving you cover-free access to Baltimore’s hottest bars, clubs, and restaurants with one wristband. Grab your cohort and prepare for an action-packed holiday weekend, because Baltimore doesn’t take St. Patty’s Day lightly. Start the night off at your registration point, Mother’s Grille & the Top pf E Cross Street – the local favorite with free-flowing booze and hunger-crushing fare before sipping on margaritas at Blue Agave, or stay green and grab a pint at Magerks. If you’re looking for an unpretentious party crowd, One Star Country Club has a jovial crew of devotees that can often be found dancing inside the brownstone nitery. Wayward’s industrial chic décor will get a festive green makeover this St. Patrick’s Day, and the smokehouse has one of the friendliest staffs in the city waiting to greet you. When you need to refuel, bite into a giant pretzel under Crossbar’s massive glass skylight or a juicy burger at Abbey Burger Bistro. 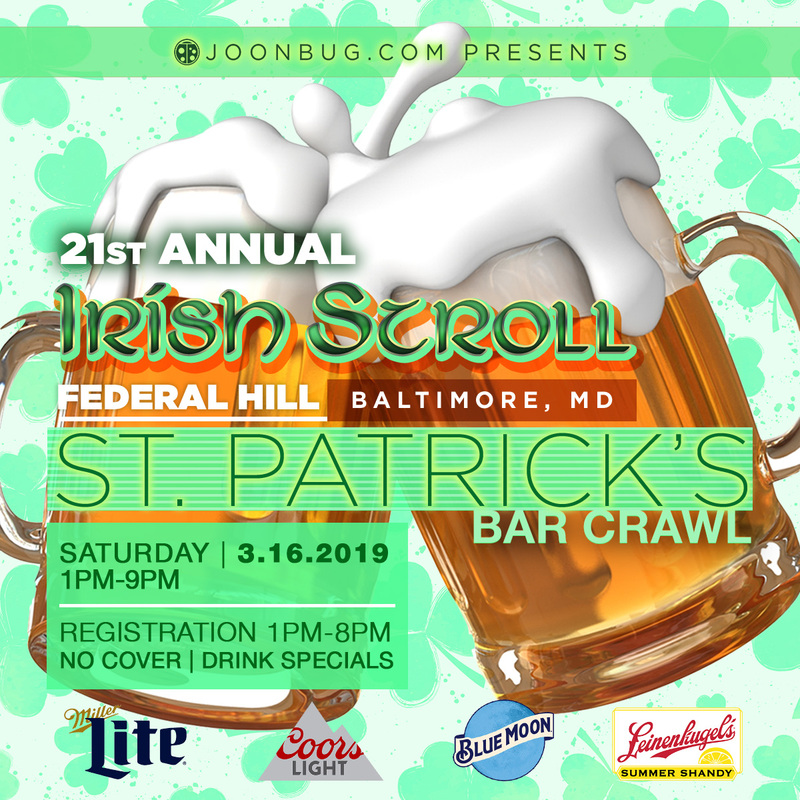 Federal Hill is pulling out all the stops this St. Patrick’s Day weekend with drink specials like $3 Miller Lite, $3 Coors Light, $4 Blue Moon, $4 Summer Shandy drinks. This is one lucky bar crawl not to be missed. Receive your wristband, map, and other items at designated registration location. Drink specials, times and prices vary per venue Ticket holders may visit participating venues in any order All sales are final. Tickets are non-refundable regardless of attendance. This is a rain or shine event. Receive your wristband, map, and other items at designated registration location. Ticket holders may visit participating venues in any order.